ADULT: Wingspan - 69 - 76mm (male); 73 - 80mm (female). The large size, distinctive flight and habitat make this one of the more easier Fritillaries to identify. 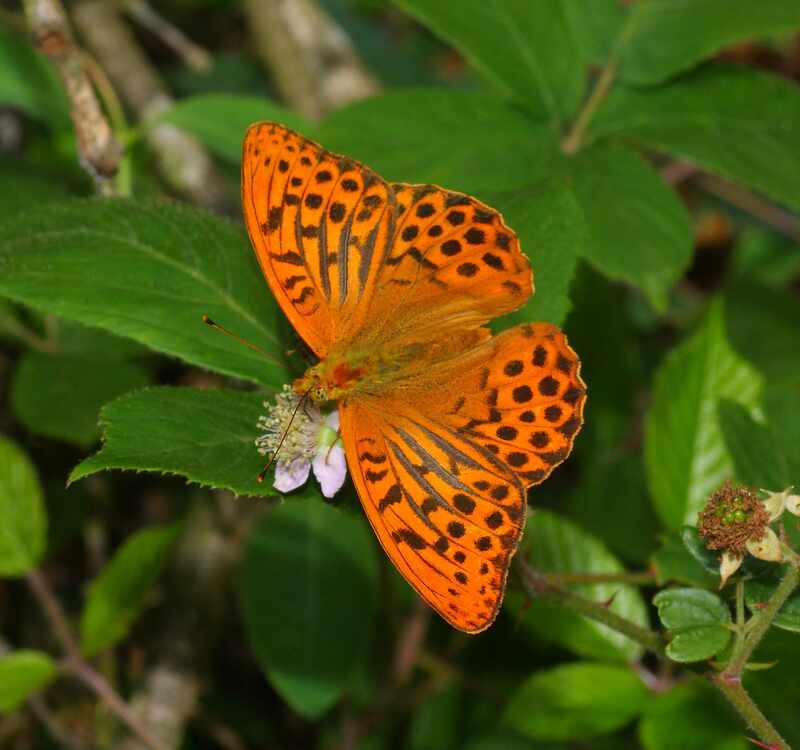 The orange brown wings have the typical black markings of the family and it is the silver washed undersides of the hindwings that will confirm identification with the combination of soft brassy green and chalk white markings unmistakeable. Males have four black ridges on the veins of the forewings (as above) and so can be told apart from the females with ease. A form known as valezina can occur with the female's wings appearing silvery pink to greenish grey. CHRYSALIS: 22mm. With a silvery sheen this structure is hard to find due to its leaf-like camouflage. LARVA: 22mm. A dark spiky creature that has two obvious yellow lines running along the length of its back. Feeds on Violets. EGG: Yellow and broadly conical. BEHAVIOUR: A powerful flyer that is seen flying down sun soaked woodland lanes or moving swiftly around open glades. They can usually be seen feeding on Bramble. The courtship flight is a marvel to behold with the female flying in a direct straight line whilst the male constantly loops around her on the same course. HABITAT: Broad leaved woodland with sunny rides and open glades. Oak woodlands are favoured. FLIGHT PERIOD: Late June - Early September.